Visualization of warehouse logistics. VBASE Automation Story. 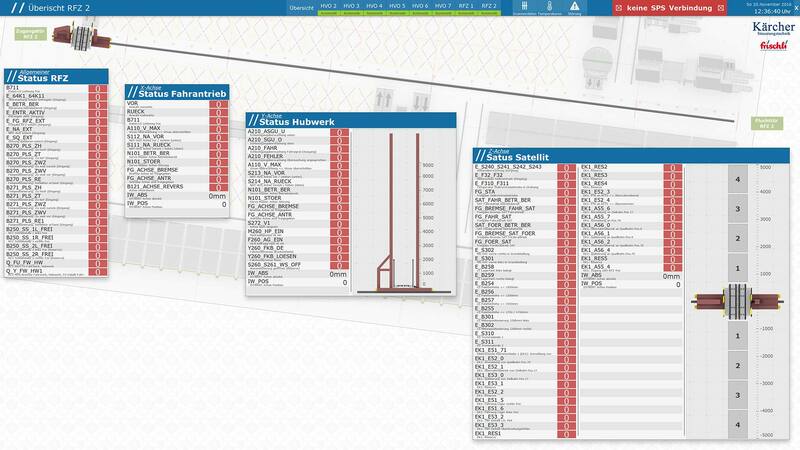 Frischli in Weißenfels relies on VBASE for the visualisation of their modernized warehouse infrastructure. 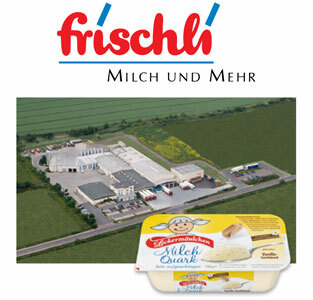 frischli Milchwerke GmbH is one of the largest dairies in Germany and markets dairy products and food for trade, food service and industry both nationally and internationally. At the Weißenfels / Saale site, approx. 300,000 litres of raw milk are processed daily to UHT milk and the well-known milk curd meal Tasty Lips. VISAM system partner Kärcher Steuerungstechnik GmbH took over responsibility for the visualisation of the fully automatic warehouse system during the modernisation of the high-bay warehouse at frischli in Weißenfels. Request our new VBASE price list. The dairy products are temporarily stored in pallet spaces with several levels and, if required, taken to order picking by rack feeders (RFZ). The products can be completely traced at any time via pallet foot labels. In the course of the modernization, the control systems of the fully automatic conveyor system were converted from Siemens S5 to S7 and the visualization of the complete warehouse was converted to a large-format, modern control room visualization. 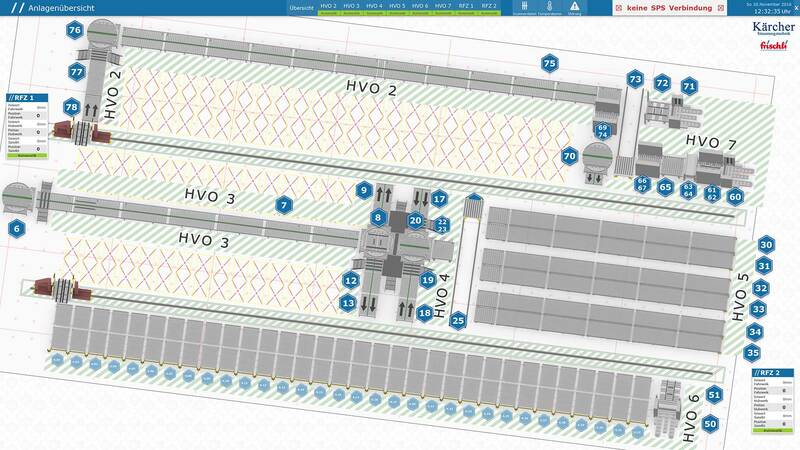 The manual on-site terminals (HVO) for manual control of the conveyor technology were also supplemented by a mobile visualisation on web tablets. The visualization, which was implemented using VBASE Server-RT, depicts the status of the storage and retrieval machines, transverse transfer cars and the pallet conveyor and testing system. In an overall and several detailed views VBASE provides precise information about the loading and the positions of the two storage and retrieval vehicles and shows the current status of the running gear (X axis), hoist (Y axis) and satellite (Z axis). The plant operator is always informed about the position of the RFZ by animation. In addition, all fault messages are logged and displayed in the visualization. The six different HVO stations are also considered in the control room view and visualize the individual parameters of the individual pallet stations. 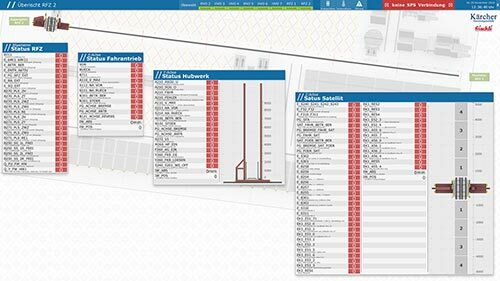 For maintenance work and to support the plant operators in manual plant operation, the data of the HVOs are also played out via the VBASE Web-Remote as an HTML 5 Web app. The web interface enables real-time control and visualization of the system via Tablet PC or Smartphone. The VBASE server runtime environment allows unlimited, simultaneous access of the web clients. In the course of further SAP integration, extensions are already planned for the near future. These include automatic data acquisition via scanner, mapping of the entire material flow and the possibility of correcting errors. Thanks to VBASE, the modernised high-bay warehouse has a modern visualisation system that contributes to an increase in logistics productivity with a well thought-out design and a high degree of clarity. The mobile visualization on Tablet PCs supports the employees on site and reduces downtimes during maintenance.